The Contact page on your WordPress website has its own importance that plays a major role in bringing potential customers and web visitors to you. It can prove out dreadful if the Contact page is not built carefully. It is seen that the website that does not display contact information lacks potential customers. Of course, all kinds of websites require visitors, viewers, and clients to be able to contact them. The way to keep in touch with a business relies on its communication ways and a contact page serves that purpose. This article post covers the role and importance of contact page on WordPress. What is the need for a contact page? For any type of website, be it an e-commerce or a blog site, an exquisite way is essential for the buyers and users to get in touch. The users might have questions, concerns, suggestions, feedbacks, and other things to share with you. The guest writers, bloggers, collaborators, associates, and so on can keep in touch with you. A dedicated contact page is vital for different types of websites. The contact information includes email addresses, contact numbers, social accounts, and physical address. With increasing number of channels, more number of people will approach you. A contact form makes it easy for the visitors to get in touch with you without leaving your website. Insertion of social media networks is yet another effective way to reach out to people. A number of concerns and queries are gathered by customer service through social media platforms. Integration of Google map aids the visitors in locating your address better. Before beginning with creating the contact page on WordPress, you need to decide carefully what information the page should have. Think about your target audience and your objectives. What are their requirements and why they will be getting in touch with you? The more you get to know your visitors, the better you will be able to satisfy their needs and provide them useful content. Let’s take an example of an online store you are running that also has a physical address. People will contact you via the internet as well as in person. Social media will be preferred by a young group of target audience. The contact numbers will be preferred by older group. Add images: The users are always interested in knowing who they will be speaking to. Add some branding to your page as that would be a great start for new opportunities. 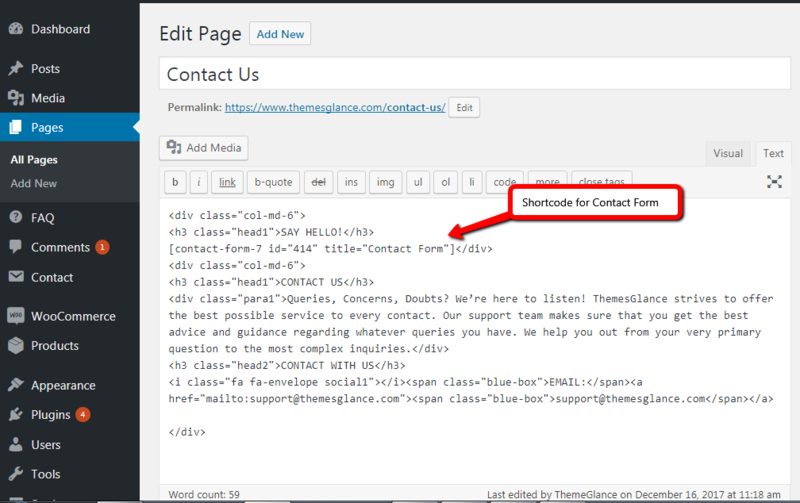 You can insert customizable contact form on your contact page via a plugin such as Contact Form 7. Try avoiding a number of fields as that might confuse the users. Place the most important and the basic contact information at the top of contact page on WordPress. With Contact Form 7, you just need to install and activate it. Paste a shortcode into the page. A contact page on WordPress is essential for creating a dedicated audience for your WordPress website through the way of communication. Thus, we see, how important it is to put some efforts into creating an effective Contact page. 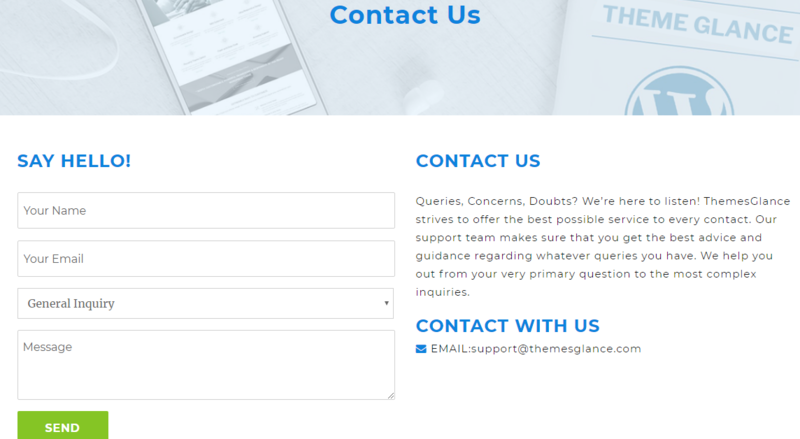 Keeping this consideration in mind, ThemesGlance has developed Premium WordPress themes with proper integration of contact pages along with all other pages. You can see the quality of our work in our themes that cover a range of business niches. Previous Previous post: How To Improve The WordPress Functionality Of Your Website?